Your face, hands, and arms are the first parts of the body to show signs of aging because they receive so much exposure. IPL skin rejuvenation treatment will help eliminate age spots, freckles and pigment lesions as well as reverse the signs of aging. Intense pulsed light essentially works by delivering energy to the skin surface and affecting dermal heating. 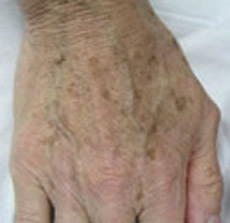 A consultation is needed to evaluate the brown spots and determine how effective the treatment might be. 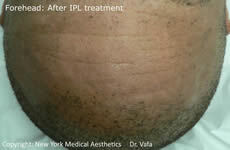 Patients should not have a tan before their laser treatment. 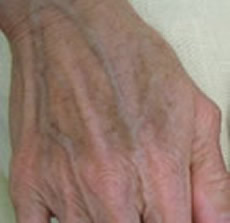 Numbing cream is generally not needed in the treatment of brown spots. Depending on the type of treatment performed, there may be a sunburn like feeling, redness, bruising and scabbing. The skin heals quickly within 3-7 days with the application of an ointment such as petroleum jelly. Virtually any part of your body with sun and age spots can be safely treated. The face, chest, shoulders and arms are the most popular areas for treatment because they have typically had the most sun exposure. Discrete brown spots, excessively ruddy complexions and skin densely covered with freckles respond well to treatment. Typically, one or two treatments are sufficient to see significant results. Additional treatments may be required for very large or dark spots, densely freckled areas, or excessively sun damaged skin. 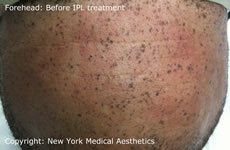 Immediately following the treatment, the spots may start to darken. You may notice a slight reddening of the surrounding skin. This typically subsides within a couple of hours. Over the course of the next one to three weeks, darkened spots will fade and flake off. Your mottled complexion will clear.